For years vitamin D has been recognized for the role it plays in strengthening bones, fighting depression and boosting immunity. More recently after decades of research, study and tests, experts are revealing that vitamin D levels…or the lack thereof also plays a role in weight management. Vitamin D is not actually a vitamin but a potent neuro-regulatory steroidal hormone that has been shown to influence about 10% of all the genes in the body. 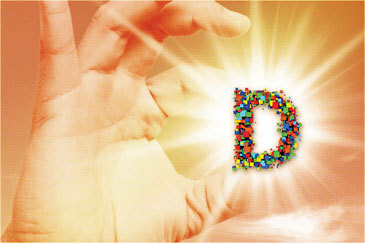 Vitamin D can be manufactured by the body provided it is exposed to enough sunlight. Because of the tragic scare that dermatologists and sunscreen manufacturers used, most people are now scared to sit and enjoy the sun without layers of sunscreen on. The overall trend of spending more time indoors and this thorough scare message to avoid the sun as much as possible has greatly contributed to the worldwide vitamin D deficiency we see today. A Kaiser Permanente Study published in the recent issue of the Journal of Women’s Health looked at more than 4,600 women aged 65 and older. The study lasted for 4 ½ years and revealed that women with low levels of vitamin D in in their bloodstream gained about 2 pounds more than those with adequate levels of vitamin D.
“This is one of the first research studies to reveal that women with low levels of vitamin D gain more weight and even though we’re only talking about 2 pounds here, over time that adds up” says research author Dr. Erin LeBlanc, an endocrinologist and researcher at the Kaiser Permanente Center for Health Research located in Portland, Oregon. About 60% of the women in the study remained at a stable weight during the testing period, 27% lost more than 5% of their body weight during testing and 12% gained more than 5% of their body weight. Often called the “sunshine vitamin” because we get most of it from sunshine, vitamin D contributes to the maintenance of our bones and muscles as well as keeping the central nervous system in check. However, vitamin D can also be toxic if you take too much causing severe nausea, vomiting and loss of appetite. Another recent study revealed that half of obese adolescents that seek weight loss surgery are deficient in vitamin D. Eight percent had severe deficiencies while 20% had adequate D levels. Without question I believe that the optimal way to get your vitamin D is from ultraviolet B exposure on your clean exposed skin with the sun as the source. Why wouldn’t it be? It’s the way nature intended it to be. Natural is always best but not always available. Bear in mind that not all sun exposure allows for vitamin D production. The only wavelength out of 1500 wavelengths that sunlight is composed of that has the ability to produce vitamin D are the UVB-rays when they hit exposed skin. You may find that you can get enough vitamin D from sun exposure in the summer months but have to adapt to other sources during winter months. When lack of proper sunshine is available as it is in most winter months, your only choices/options are a safe tanning bed or orally swallowing vitamin D3. The only way to find out how much vitamin D you really need and get is to get your levels tested regularly to make sure you stay within the optimal range of 50-70 ng/ml and adjust your dose if needed. In the summer months you should easily get enough vitamin D if you spend some time outside every day. Vitamin D has taken center stage as doctors have become increasingly aware of its importance. A growing body of research clearly shows that D is absolutely essential/critical if you want to experience great health and prevent disease. Stay tuned for more studies to be released now that they are further exploring vitamin D’s relationship to weight management. Vitamin D is only one of many weight contributing factors. If you struggle to keep weight off after you’ve worked so hard to take it off, don’t dismay. There is a workable solution to this problem. With the proper training, you’ll completely change the way you view the weight loss process. “Stop Weight Loss Resistance”…you can succeed with the right help.